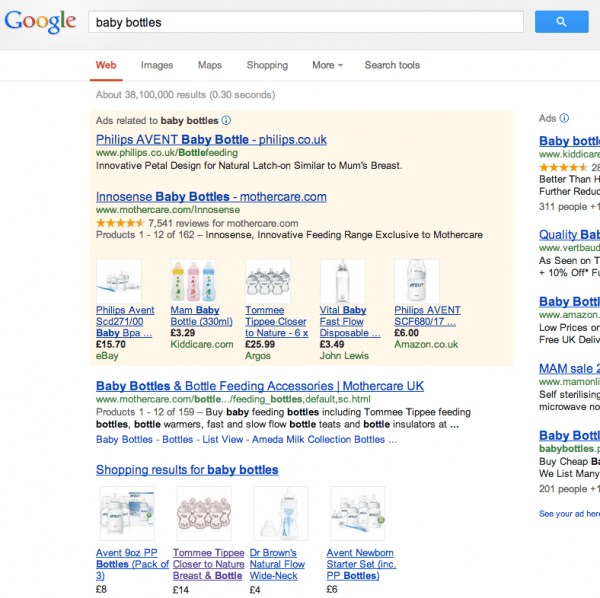 From today, February 13, Google will phase out free listings in UK Shopping searches. As Google Shopping changes, marketers will need to budget for clicks they previously got for free and get to grips with the Merchant Center, product feeds and product listing ads. Change is coming. After ten years of sending free consumer traffic to online businesses, Google Shopping is ending its charity. 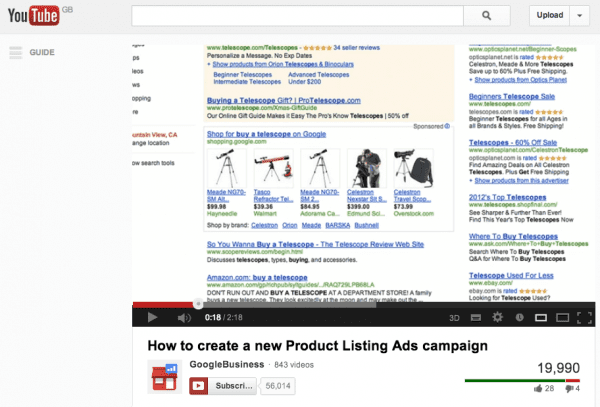 From February 13, free listings will begin to disappear from Google Shopping. In their place, we’ll soon see more and more of the Product Listing Ads: big, shiny, image-led adverts which contain all the info a shopper needs to make a purchase there and then. This is an example of how they look in all their glory. Check the Google PLA introduction video for more detail on how to create them. In the US, where Shopping went paid in October 2012, retailers are singing the praises of product listing ads. The Q4 Online Advertising report by Marin for the US showed that Google Produce Listing Ad Search clicks were up by 210% and PLA budgets grew by 210%. This shows the impact that this will have in other markets like the UK as it is introduced. And interestingly, it’s not just the Internet big-boys who are benefitting... The Google Shopping algorithm seems to have levelled the playing field somewhat; allowing smaller retailers the chance to be seen high on the results pages. This evolution in paid search isn’t just about the biggest or strongest surviving: tiny retailers who have managed the transition to PPC in Google Shopping well are seeing good returns on their investment. The fact Amazon has pulled its product listing ads immediately opens a whopping gap in the market for niche retailers… and Google. As Amazon sells everything, and customers often react well to its suggested related products and on-site search function, it has often been seen as having online shopping sewn up. Now, niche retailers who may’ve previously lost out to the Amazons of this world can benefit from better search visibility. As for Google… well, a quick look at the US Google Shopping site displays something akin to any other online marketplace: you can search for the products you want, see images and descriptions, see the price and the retailer, and click to buy if you like something. Much as you would on eBay, say, or Amazon. We’re unlikely to see something as holistic as this portal-style approach over here for a while: Google’s phasing in the transition from now until June, which means text ads will still appear in Shopping (alongside some free listings). From the Summer, though, all Google Shopping results will be paid for. And it’s highly likely that, by then, the Shopping search function will resemble a marketplace in its own right. In the meantime, Google’s offering a 10% discount on PLA spends for retailers who get going early: this offers a decent incentive to try out product listing ads and test what is going to work for your business. So, what does Paid PLAs mean for Internet Marketers? 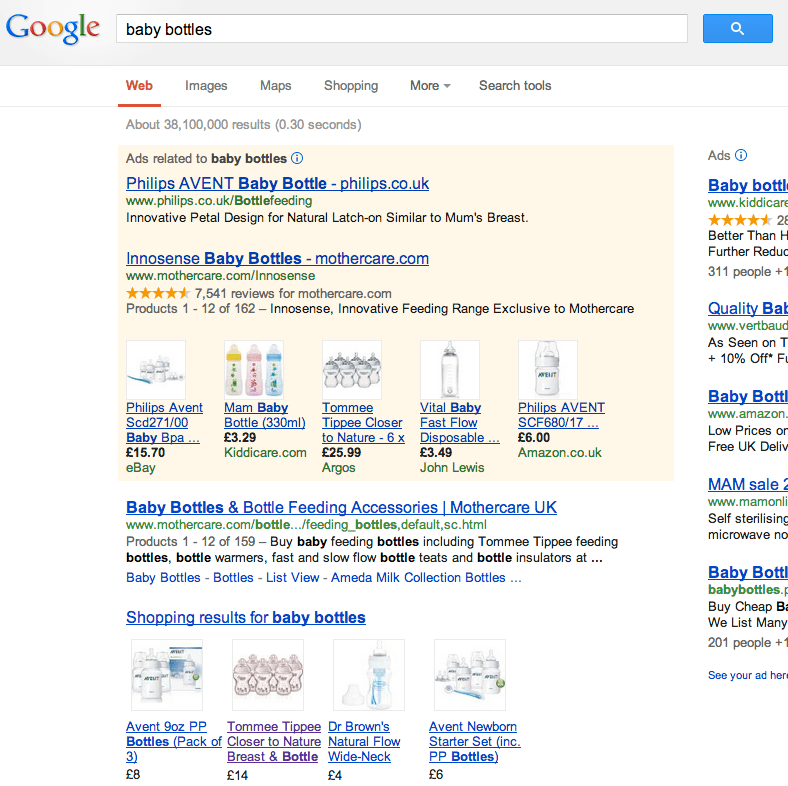 Well, it’s worth noting that Shopping search is seeing rising numbers of users: who look for a lot of different things. Shoes? Of course. Hats? For sure. But Plumbers? Mechanics? Solicitors? It seems odd: but even services like these are being searched for in Shopping. And that means Shopping optimisation really is a vital consideration as part of any businesses’ online strategy. The Devil though, as usual, is in the detail. We’ll get into some positives shortly: but it’s worth noting one big metric is down, and that’s average basket values. Average order values have dropped by around 12% in the US since Shopping went paid. Why? Well, because Shopping is becoming the search destination: not retail sites. That is, consumers go onto Shopping and search for “hats”, find a hat they want, and buy it. They then go back to Shopping to look for “shoes”; rather than staying on the retail site where they found their footwear and using their on-site search to browse for other products. This shift in behaviour is really interesting: especially as Google will earn more for subsequent Shopping clicks than it would if searchers stayed on retail sites. And that means there’s clear incentive for Google to try to make a Shopping portal which is all-singing and all-dancing. This, say some, means Google really is tackling Amazon head-on: a battle which is going to be very interesting to watch in the coming months. Even more interesting, really, are the upshots: research from Kenshoo, Marin Software and Adobe found PLAs improve Google advertising for businesses: and in nearly every case, they smash traditional text ads in every conceivable metric. In the report referenced above Marin Software found product listing ads get 210% more search clicks now, and that US advertisers are allocating around 30% of their ad spend to PLAs. This allocation is a sound strategy: the overall impression share of PLAs rose by 60% in December. Elsewhere, RKG found the average CPC on a product listing ad is 26% lower than traditional AdWords text ads, whilst Adobe claims PLAs get 34% higher clickthrough rates. All the signs point to this being a genuine improvement for search users (as spammy businesses are less likely to pay to appear in Shopping, or put the work in to optimise their product feeds), and for retailers: who should enjoy far better conversion rates if they get PLAs right. As Darwin posited, evolution isn’t always about being the biggest or strongest. It’s about adapting well. What are the new PLA Algorithms? The algorithm used in Google Shopping rewards this: retailers who regularly update their Merchant Center product feed should see their ads appear more often. Keyword bids are less of a factor: meaning big company ad budgets can’t be used to displace those with less to spend. The quality of descriptions helps too: creating unique content is always a sound idea but in this case, it could really set PLAs apart from competitors. Of course, as with all things new, nobody quite knows yet how this is all going to work in the UK. But there’s less than a week left now to find out. If you want more information on what’s actually happening with the Google Shopping changes, we’ve put together a free white paper on the Google Shopping changes and product listing ads. We’ve also put together some tips for Google Shopping success, and we’ve covered the Marin report on product listing ads, and Google Shopping research from Adobe and RKG. Thanks to Amy Bott for sharing her advice and opinions in this post. Amy is Director of Paid Search & Affiliate at ClickThrough Marketing with her key focuses being data analysis, strategic planning and team development of Clickthrough Marketing. You can follow her on Twitter or connect on LinkedIn.